not go through all this effort, but this is how I wanted it today. I was waiting for the full moon at 5:22 to smudge. But seeing as how it was a rainy day here, I thought I'd save "the exact moment of moon fullness" to smudge the inside of my house and just pick any old dry time to smudge my property. All my efforts for a dry experience were thwarted though. First, though, I don't usually smudge my property. I usually just smudge inside the house. But for some reason, I kept feeling a need to do the entire property, including my cars, so I did it. The front yard went pretty well. But by the time I worked my around to the back yard, the rain had started. Then the sky opened up and dumped bucketsful of water on me. Which isn't good when you're trying to keep sage lit and burning. I wasn't sure whether this was a good thing or a bad thing. The violence and suddenness with which the skies opened up made me feel as if something wanted me not to smudge the yard. Then again, I could think that the rain was helping to purify. Believing in signs and all sorts of mystical things can be confusing sometimes...haha. 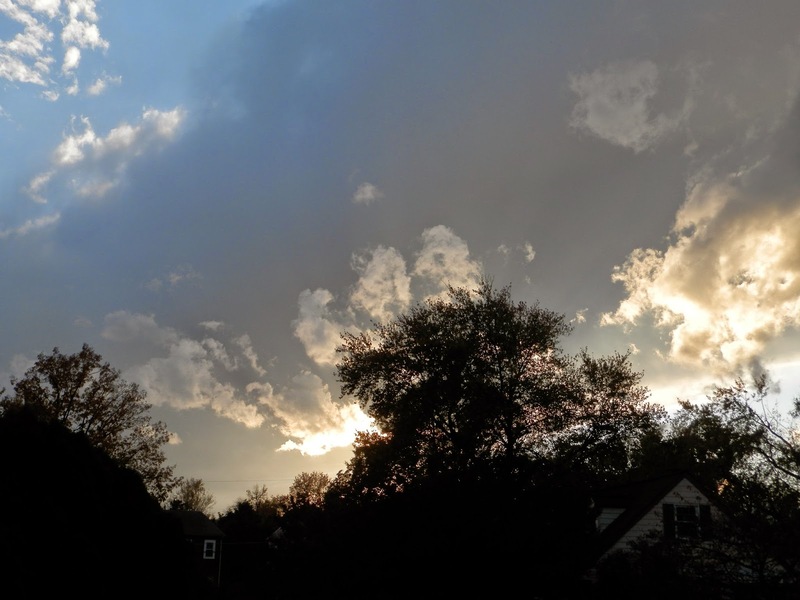 So I did go out and make another pass at the back yard when the rain stopped and that time the sun peeked out from behind a cloud, lighting up the reds and oranges of the neighborhood trees with godlike rays. That sign was not confusing at all. and didn't take the pic until afterward. But it got me thinking. It took the equivalent of two small sage bundles to smudge the back yard. Some energy out there was just eating it up. Sometimes you'll see the smoke do interesting things...be drawn to a certain corner. Or, like when I smudged inside the house, it might get very smoky in areas where it's most needed. My back yard is what I consider to be my sacred space. I would have never suspected it of needing extra care, but it did. It devoured the second smudge bundle and there was just enough to cover the whole area. So I'm glad I decided to clear the property, too. If you said to me right now, "it's magical thinking to think a burning herb can clear negativity or bring positivity into your life," I wouldn't be able to disagree with you. There are many things I do and believe that I'm not 100% on and cannot explain. All I know is that they work. For me. Catholics use incense in ritual, Native Americans use it, Buddhists use it...they could probably all tell you what they feel the burning does. But you won't find proof of any of it. Yet. Right now, it's all just mysticism and belief...just like everything we believe without scientific proof. That said, the air is completely different inside my home now than it was this morning. And whether that's measurable or not doesn't matter. It's true for me. And because it's true for me, it actually HAS shifted the mood. And that's all that ritual is about...going through motions that make us feel more empowered, protected or whatever. You don't even need spirituality to have rituals. Your morning routine is a ritual. The nightly "checking of the door locks" is a ritual. They make us feel safe, grounded. And when they're done mindfully and with intent, they can have an even greater impact on our psyche. BTW, I didn't have to do this in conjunction with the moon, so if any of you are thinking you missed an opportunity, you didn't. Besides, the full moon energy, if you believe in such a thing, exists the day or two before and after the actual full moon. So you still have time. 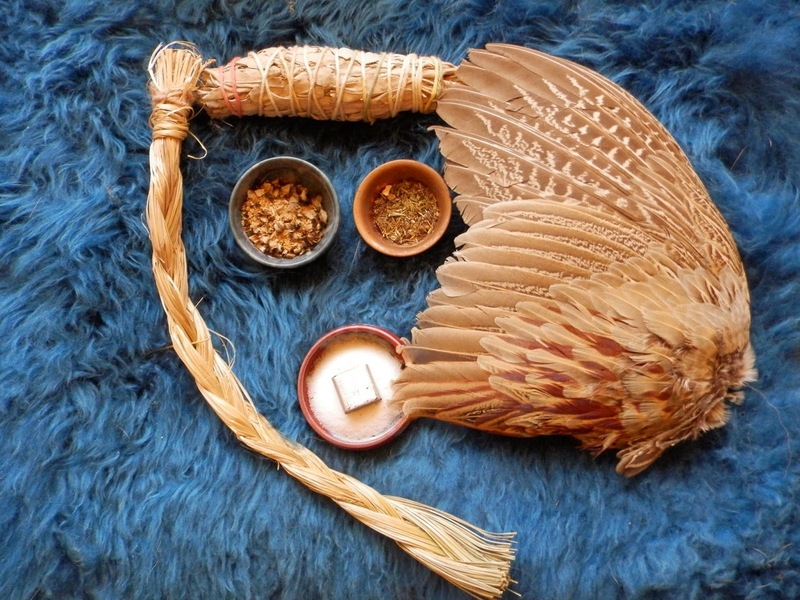 What are your spiritual rituals? When do you do them and why? And do you have any herbs that are sacred to your beliefs? PS I meant to say I agree with your comments about rituals and "magickal thinking". It works because I intend for it to work and I expect it to work. As you said, "It's true for me." There are lots of magickal things other people do that just don't resonate with me. But I know they work for them, so it's all good.